1. The Environment: According to a 2003 study published by Women’s Environmental Network, disposable diapers are the third largest consumer item in landfills and make up about 4 % of all solid waste. No one knows exactly how long it takes for the average disposable diaper to decompose, but it has been estimated at anywhere from 250 to 500 years. That means that the diapers you throw away today will still exist when your great, great, great grandchildren are born! Even after they are outgrown, cloth diapers can be used as rags, extending their usefulness for years. 2. Cost: Though cloth diapers cost more initially, they can be used on 100-150 times, on average. Cloth diapers can often be used for more than one child, too, so costs decline dramatically when younger siblings are born. The most expensive diaper services cost about $20 dollars a week, and the cost for home laundering diapers is dramatically less. 3. Not Your Mother’s Diapers: Forget about super-bulky diapers and leaky plastic covers! Cloth diapers have come a long way since the Boomers were babies. 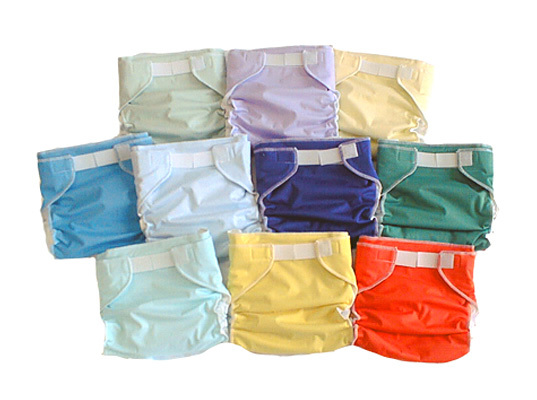 Today’s diapers come in every color under the sun, and pins have been replaced by clips, snaps, and Velcro closures. Numerous fit and style options make cloth diapers fun and functional. 4. Potty Train Earlier: On average, cloth diapered babies potty train a year earlier than babies who wear disposables. This is probably because disposables have a tendency to feel dry even when wet, so it takes longer for the child to realize what it feels like to be wet. 5. Better for Baby’s Skin: Because they commonly feel dry even when wet, disposables aren’t changed as often as cloth diapers. This leads to diaper rash and other skin irritations. Also, cloth diapers contain plastics and other chemicals that can cause skin irritations or allergic reactions. Thank you for this post. I'm wrestling with the disposables-cloth diaper issue now. I just want to be sure in the last line of point 5 you meant disposables contain plastics and other irritants - yes? Avoiding chemicals was a big motivator in choosing cloth for my son. Plus, they're just so damn cute. Bum-Ware AI2s are my favorites (after trying several different brands and styles on my 12 week old 16-pounder). Love the color options (currently have brown and orange) and fast drying (since I don't own a dryer). Can't recommend them highly enough! Also, aren't disposables supposed to be scraped, too? I thought the packaging says that. Poop really doesn't belong in landfills. I can't stand the thought of all those diapers sitting in landfills for HUNDREDS of years. For me, cloth diapering has been worth every bit of effort. I should add that it really isn't that hard. There are biodegradable, flushable inserts that you put in the diaper that catch all the solids. After you remove this thin insert and flush away the poop where it belongs, you just wash the diapers. I do an extra rinse. In the end, it's really just another load of wash. I have a 15 month old who has been in cloths since she was born and I love it, I wouldn't do it any other way. I've tried a lot of styles and I love Bum Genius All In Ones. They fit great and wash clean. Once you use these, you will never go back to disposables.